According to Alexis Krisay, owner and VP of marketing at Serendipit, every post that leads to a call to action has a Facebook tracking code on it, so Serendipit can monitor click-throughs and the post’s success. “We’re really big on evaluating which content was most successful each month.” she says. 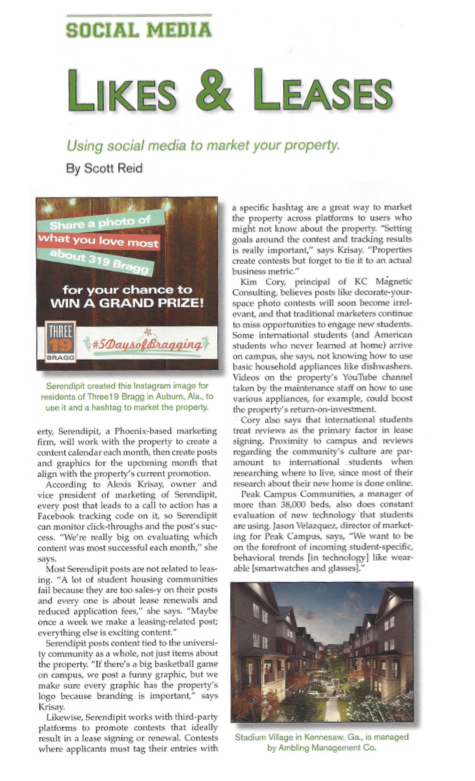 Serendipit posts content tied to the university community as a whole, not just items about the property. “If there’s a big basketball game on campus, we post a funny graphic, but we make sure every graphic has the property’s logo because branding is important.” says Krisay.